If someone tried to form an opinion of Václav Havel’s presidency based on what President Klaus has lately been saying about the late President, the result would not go down very well with those who knew Václav Havel personally. None of them remember Havel as an extreme leftist, nor a post-democratic elitist, nor a modernist destroyer of the democratic order, nor indeed an enemy of the state. A much truer picture of Havel emerges from the eulogy the very same President Klaus gave at Havel’s funeral a year ago, when he said that we had lost a President, a politician, an intellectual, an artist, and a man whom the country will remember with gratitude, esteem and respect. Given that Klaus himself warned against Havel’s work and legacy being oversimplified and distorted, he must have a compelling reason for doing it himself. The compelling reason why Klaus feels the need to contrast himself with his predecessor is the fact that his own presidency is coming to an end. Klaus seems to find it difficult to accept that nobody will miss him and that he will not be remembered fondly because of his arrogant behaviour, his scandalous amnesty, or the pilfering of the state coffers under his watch, which he has come to symbolise and epitomise in political terms. 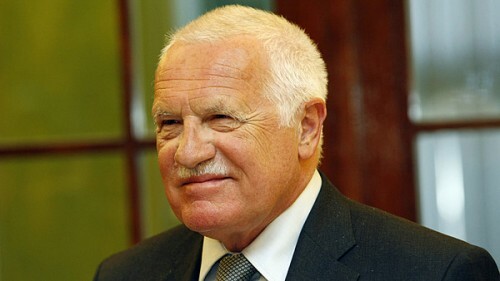 The problem of Václav Klaus, an ambitious and self-centred man, is realizing that nobody cares about him any more. So he makes irritating, over-the-top statements purely for the sake of provoking discussion or, at the very least, to make someone write what a pathetic embarrassment he has become. Even that is preferable to vanishing from the media without a trace and being forgotten in his own lifetime. If Klaus wants to be compared to Havel, it is pure masochism. Havel attracted people while Klaus has repelled them. If for no other reason than because, while Havel was modest and always doubted himself, Klaus is prone to arrogant lecturing. Havel the writer used to reflect on human existence, while everything that Klaus has written has been about himself. Admittedly, they were both presidents. Except that one was a bohemian and the other an ordinary accountant. The original of this article appeared in www.deník.cz.